"Great appetizer on crackers! Whenever I go to a party, I get requested to make this. I never come home with leftovers! I like to use Lawry's Tabasco Seasoned Salt, it's hot, but good!" 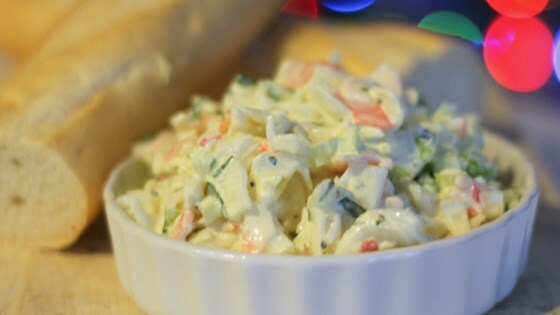 In a large bowl, stir together the crabmeat, celery, onion, parsley, mustard, mayonnaise, pepper, and garlic powder. Season to taste with seasoned salt, fold in black olives if using. Cover, and refrigerate for at least 45 minutes. Taste before serving and adjust seasonings to taste. Very good we all liked it very much..
very good, I didn't use mustard but added 1\2 cup sour cream and a little dill.Would work well with salad greens,sandwiches, crackers etc. Easy to prepare and so good. Delicious. Guests raved about it. I put too much mustard in so I tried to dilute with sour cream. Used some Frank's Hot Wing Sauce for an extra kick. Turned out FANTASTIC! Very good! Made for a hoiliday cookout and made a sandwich with the leftovers the next day and it tasted even better after sitting overnight! Great dip! It was thick and hearty and could easily be served with crackers, bread, pita chips or bagel chips! It was a great hit and super easy to make. Delicious! Made this for a party I catered. It disappeared in no time! Thanks.